EPISODE 8, SEASON 2- "THE THINGS WE BURY"
Lots of cool stuff happened on tonight's episode of "Agents of S.H.I.E.L.D." At this point, I am not sure what I am more interested in, Ward's story, Skye background and her father, or this continued Ping-Pong game between HYDRA and S.H.I.E.L.D. to discover the secrets of The Diviner. This may seem like a lot of story to tackle in one season, but ABC is doing an exquisite job of keeping everything connected and keeping moving at a comfortable pace. This is the type of storytelling I feel we got way too late in the first season, and this second season has benefited quite a bit from focusing on two or three stories a season, rather than a new story every episode. Someone who stood out on tonight's episode was Reed Diamond. Diamond has been playing Daniel Whitehall, a brand new high representative of S.H.I.E.L.D. 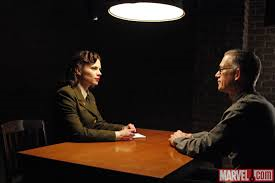 If we remember from the season premier, Peggy Carter (Hayley Atwell), captured Whitehall as well as the Diviner. On tonight's episode, we learn that it was Carter who made sure Whitehall stayed behind bars, up until the 1980s when he was freed from undercover HYDRA agents. We also learn how Whitehall was able to stay young now in the 2010's. Over the course of this season, Reed Diamond has done a good job turning Whitehall into a snarky villain, someone I love to root against every week. I was glad that this season has taken the time to really get to know our villains, I love the little mini-origin story for Whitehall. I think Reed Diamond has been doing very good work so far this season, and I can't wait to see how his character materializes. Diamond has had quite the relationship with Joss Whedon over the years, so it comes to no surprise that he would turn such an astounding performance. I also think Kyle MacLachlan is really standing out as The Doctor. We haven't really seen much of The Doctor so far, and it seems that is going to change really quick. 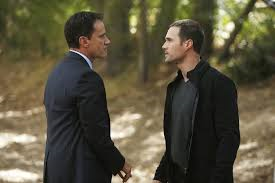 After this episode, much like Agent Ward, I am not quite sure which side The Doctor is truly on. Perhaps he isn't on any side, perhaps he will become a wild card, tormenting S.H.I.E.L.D. and HYDRA with glee. I have always found MacLachlan to be supremely overrated, and I think "Blue Velvet" is one of the very best films of the 1980's. In fact, I have loved all of his work in which he collaborated with David Lynch. However, I don't think he has ever felt so comfortable in a role, never felt this loose before. Something feels different in the way he acts, and I really dig what he is doing so far. Just as much as I am on the fence about MacLachlan's The Doctor being a wild card, I just don't know who Ward is really working for now. Last week, he gave up Whitehall's right-hand man to Director Coulson (Clark Gregg), and now he is sitting, front and center, with Whitehall. We saw Ward betray S.H.I.E.L.D. last season, but now he seems to still have feelings for Skye. Could Ward be playing both sides? Or is he still truly committed to HYDRA and he has plans to kill Skye? I feel it could go both ways. I love that Brett Dalton has finally turned this dimensional cliche into a full-fledged character. The scene with his older brother nearly flattened me, and for a second, I was convinced they were going to join up as some kind of team, and I was shocked to see I was dead wrong. We still know very little about the city Coulson found last week or the true power of The Diviner. I think The Diviner could be a bridge to The Inhumans. I really don't think Marvel would put something as big as an Infinity stone in the show. We shall see though, but like I said last week, I think some big Easter Eggs are on their way.